We discovered Sea Dream at the Chula Vista marina in Southern California in 1992, after years of walking docks – searching for a couple’s boat to explore the beautiful Northwest waters. 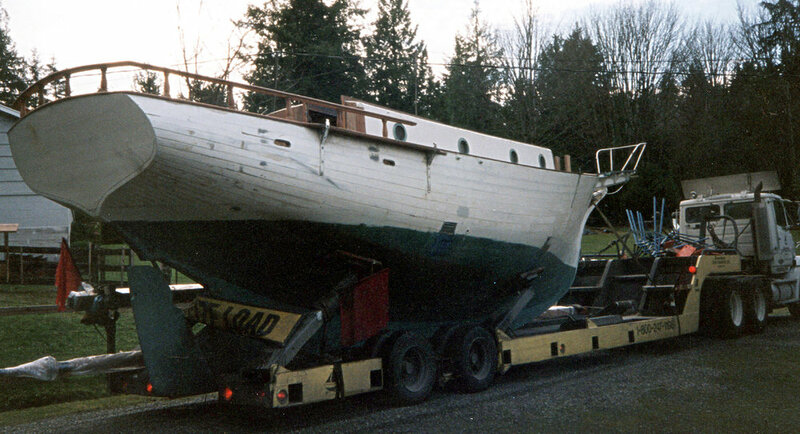 Sea Dream was suffering from severe neglect, but she had good bones – Apitone framing, iron bark stem, mahogany planking, bronze screws and copper rivets. Hugh Angleman, known as the Grande Old Man of the Pacific, was famous for designing the legendary “Mutiny on the Bounty” ship for the original film. He also designed Humphrey Bogart's "Santana" and the ocean-crossing Sea Witches. Sea Dream’s traditional lines and romance of a time gone by had us hooked. Her restoration began in Port Townsend, continued on Bainbridge Island and after four years out of the water was re-launched in Port Orchard. Since Sea Dream has been a member of our family, we have re-powered the original 20 horse Albin with a 43 horse Mercedes, installed all new electrical, radar, GPS, plumbing, stainless steel tanks, prop, shaft, hand grips, stanchion bases, new bow pulpit, spider bands, bronze step plates, stem head fitting, dead eyes, windless, winches and rigging. We have taken great pleasure in customizing her design without compromising quality or her classic charm and traditional values. Over the years, we have redesigned and replaced the cockpit, helm seat, binnacle, house trim, king plank, teak decks, toe and rub rails. We replaced her companion way doors and added custom stain glass, reworked her galley; new refer, stove and cabinetry – added marble counters, brass sink and fixtures. We designed and commissioned custom carved pieces, reupholstered all cushions, designed all new cabinets for the head and installed new sink, mirror and marble. Most recently we have a new suit of sails hand crafted by Port Townsend Sails. We at Sea Sensations have a great appreciation for the local artisans and quality craftsmanship. We would like to offer our heartfelt thanks to the many involved throughout the years. We welcome you aboard!